I’m sad. Detroit is my native city. It’s decline from being arguably the world’s richest city to being America’s “first Third World city” is tragic, politically criminal, and a warning to other Americans. The official declaration of Detroit’s bankruptcy last week could not have come as a surprise to anyone familiar with the Motor City’s atrocious financial condition. The city had no hope of ever recovering from its colossal over-indebtedness, and without a central bank standing by to create fiat credit to augment its insufficient revenue—the scheme that is the only thing keeping the even more colossally over-indebted national government solvent—the only question was when someone would pull the plug. Fiscally speaking, Detroit had been in the “walking dead” category for years. 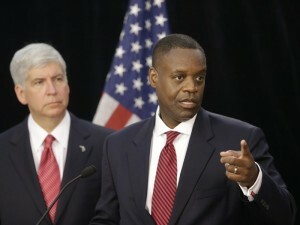 Last Thursday’s [July 18th] announcement by Detroit’s emergency manager, Kevyn Orr, finally acknowledged the inescapable facts. Clearly, some Michiganders are still in denial and refuse to face those facts. Last Friday, Ingham County Circuit Judge Rosemarie Aquilina insisted that the Chapter 9 bankruptcy declaration be withdrawn, stating the Michigan constitution forbids any action that would decrease the pension benefits of public employees. In the first place, Judge Aquilina should read my article about will and abandon the delusion that a constitution can alter reality by making nonexistent funds magically appear; in the second, it is an unjust constitution that confers a protection on public employees that private-sector employees don’t have. A sounder constitution would have prohibited the city government from gaining control of employees’ retirement funds contributions and instead have mandated that those contributions all go into a private fund in the workers’ names where the city couldn’t touch them. The ideology that causes Judge Aquilina to believe that political action—policies, laws, even constitutions—can make reality conform to one’s political vision is the very ideology that already has devastated Detroit. Politicians believed that they could create a “fairer” city by raising taxes on businesses and productive individuals and redistributing wealth to favored political constituencies, particularly the public sector unions. In doing so, they killed the goose that laid the golden egg. So, what happens now? It’s hard to feel sympathy for any of the vultures who are squabbling over Detroit’s carcass. Municipal bondholders certainly don’t merit sympathy for the huge losses they will incur. Anyone who invested in the debt promises of such a corrupt and poorly managed city deserves to lose money. They would have had to be blind not to see how broke the city was, so it seems that they made a cold, cynical, calculated bet on Detroit’s predatory government continuing to be able to find victims from whom to extract more money. While acknowledging that there are dedicated policemen and teachers in Detroit who labor under difficult conditions, it is still hard to justify economically the generous pension promises they have received when the average response time to a 9-1-1 call is 58 minutes and educational results have been so abysmal. Just as individuals sometimes resolve to change their ways so that someone who has departed has not died in vain, the demise of Detroit may not be in vain if we learn its grim lesson and reform city, state, and the federal government from their destructive predatory policies. Atlas has shrugged in Detroit. You had better restrain government so that Atlas doesn’t shrug where you live.